Google's Nexus One support forums have been flooded with anecdotes about the phone's poor 3G connectivity, so one user decided to follow up with some reasonably scientific tests. The conclusion? 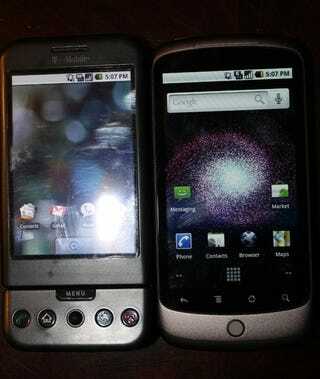 The Nexus One is kind of terrible at basic cellphonery! Does the Nexus One Have 3G Problems? The test was simple and limited, consisting of one dude, user WV, wandering in and out of his house, recording signal strength as measured in dBm and ASU with Android's built-in metering app. Assuming the Nexus One is supposed to work like a normal cellphones—that is, it connects to 3G networks when they're available and EDGE only when they're not—something's wrong. OK. I found "Phone Info" screen through "Any Cut". This looks like a screen not intended for average users. It clearly has settings that should not be messed with. However, it does have a pull down menu that was set to "WCDMA Preferred". I changed this to "WCDMA Only". The phone reset, and never again saw the f'ing "E" on the signal indicator- ALL 3G. After about 1/2 hour of speed tests (150k - 800kbps) and google satellite map downloads (all definitely faster), I switched back to "WCDMA Preferred". Guess what? After a few minutes, I was back on EDGE, even with a good signal. Switched back to "WCDMA Only", and 3G it remains. My concern is whether T-mobile is being sneaky about this and purposefully dumbing down the 3G to Edge to reduce cell frequency congestion and/or their back-end network congestion.